Last year during 2KCBW, I mentioned that I was going to learn to steek. I had all my research done and my game plan mapped out. All I needed to do was to “just do it.” But nothing happened. 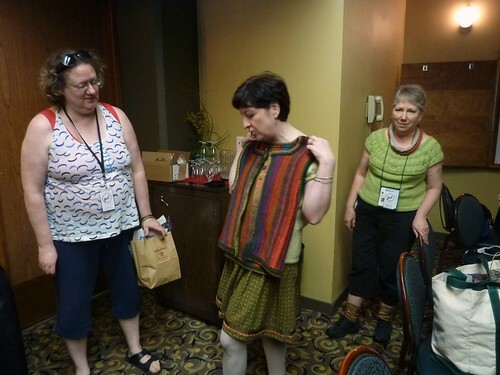 Eventually I realized I needed something to force me into it, so I signed up for a steeking class at my LYS. Unfortunately, I was the only person to sign up (chickens! ), so the class was canceled. I thought I was off the hook. 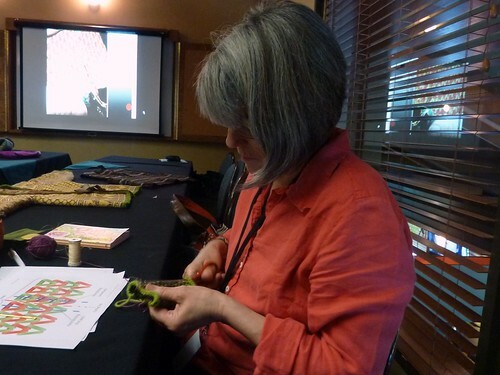 Then came the word: Mary Scott Huff, author of The New Stranded Colorwork, was going to teach a steeking class at Columbia Gorge Fiber Festival. It was time to commit! Mary is an absolutely fabulous teacher. She’s funny, warm, down to earth…and fearless. Which you’d have to be, if you’re telling people that they’re going to cut up their knitting. 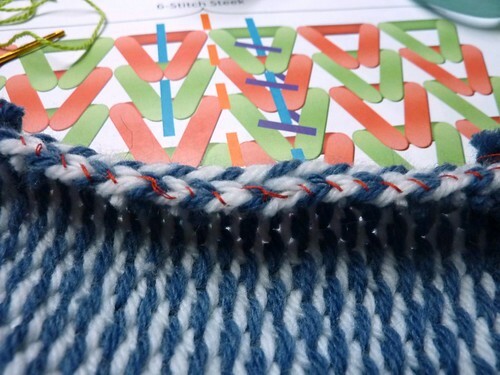 Apparently I had the right idea last year: steek on a swatch that you don’t care about. This works with the Tink Drop Frog class that I teach, too. There’s no emotional investment when you’re experimenting on a swatch! Perfect. We learned 3 steeking techniques. 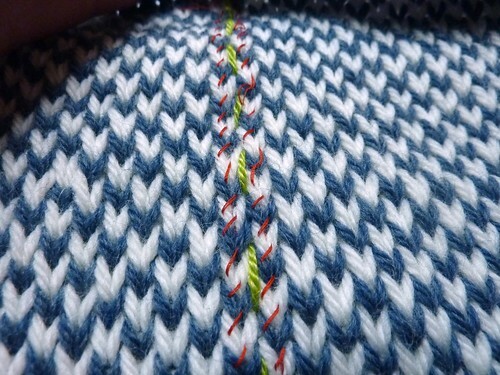 The first used simple stitching to mark and reinforce the steek. Recognize this picture from Tuesday? The green yarn marks the cutting line, and the red thread is the reinforcement. The first cut is the scariest, but Cathy wasn’t scared. Me, neither. It’s a swatch! 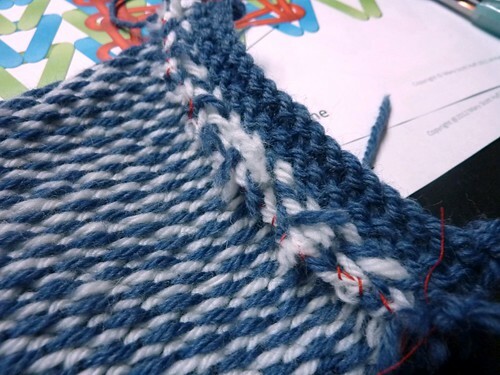 The edge isn’t terribly stable, but it’s good enough that you can pick up and work an edging, a couple stitches in from the edge. This is an edge that you’d want to cover with seam binding or something similar. 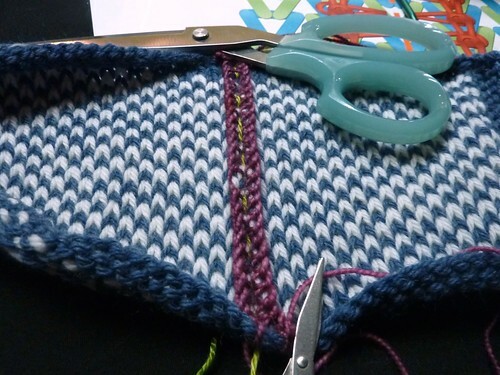 I’ve picked up and knit a garter stitch edging; see how the steeked edge turns to the back of the fabric? This edge feels more stable than the sewn one. 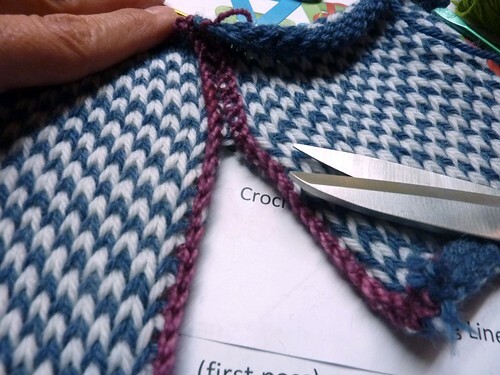 It’s good for armholes and button bands that will roll to the wrong side of your knitting. And in good non-superwash wool, it will eventually felt to itself and you won’t have a care in the world. It doesn’t need to be covered. You could choose a coordinating color for the crochet stitches, and have that be a secret feature on the inside of your knitting. All in all, a wonderful and empowering class. And after class, we got to check out Mary’s samples from her new book, Teach Yourself VISUALLY Color Knitting, that’s coming out next month. 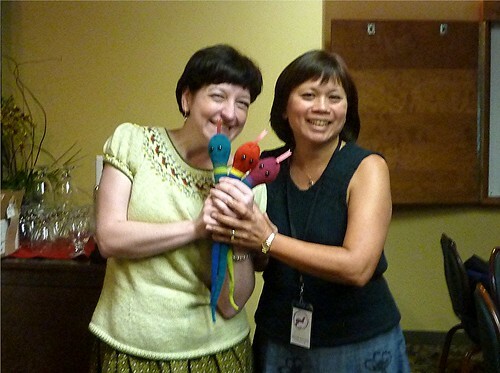 After class, Cathy and I celebrated. 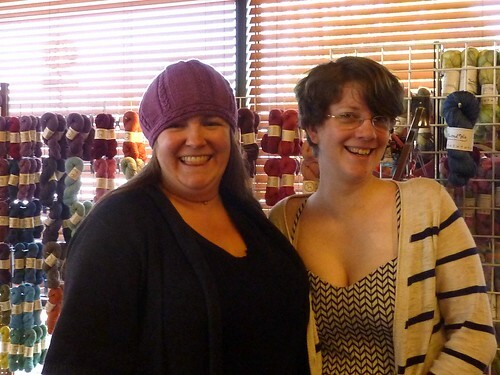 I was singing in church that morning, so I only had 30 minutes in the market before class time, but I did manage to say hi to Brooke (SincereSheep) and Lorajean (KnittedWit). Brooke is wearing her Pointer hat! All right; you’ve seen my steeking adventure. Do you want to steek? Let’s do it! 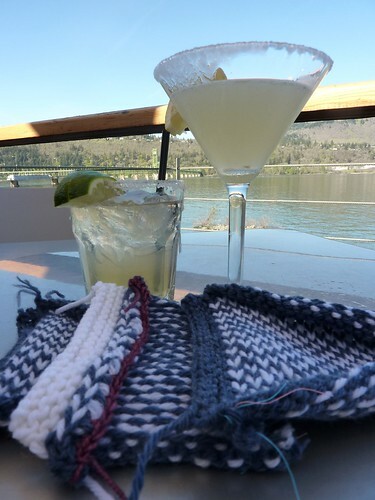 This entry was posted in Blogging, Knit and tagged 3KCBWDay6, columbia gorge fiber festival, steek. Bookmark the permalink. Great post. Well done and informative! Looks like a great class! I’d like to do more colorwork before I try steeking. Brava, brava! 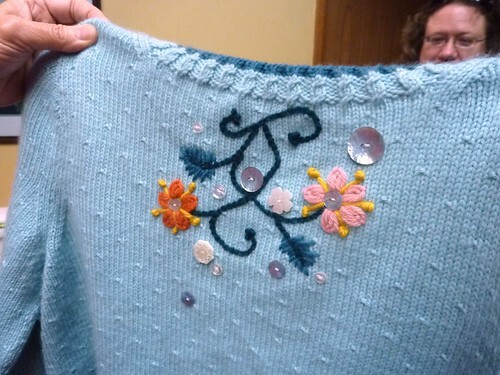 Lovely work, and good on you for taking the plunge and cutting into your knitting! You make it look easy — but you can’t fool me! I’m absolutely terrified of steeking. That’s why we do it on swatches, first! No pressure! SO cool! What a great class!